In comparison to apocalyptic literature found in Isaiah, Ezekiel, Jeremiah and Zechariah, Daniel's apocalyptic prophecies were quoted or referred to the most in the New Testament some 600 years later. And while it was the shortest book of the Major Prophets (Isaiah, Jeremiah and Ezekiel), history has shown that Daniel contained the most fulfilled prophecies than any other book of the Bible. The historical context of the book of Daniel is revealing. In the third and final Babylonian deportation of God's people, Solomon's Temple was razed to the ground, many were killed, and even more were expelled from their Promised Land condemned to captivity and enslavement in a foreign land. Outwardly it appeared that the God of the Hebrews had been discredited, and inferior to the gods of Assyria and Babylon. The Hebrew name "Daniel" means "God is my Judge." Tested several times by Gentiles and his faith affirmed by God, Daniel's name and character testified to the reality and sovereignty of his personal God (Dan 1:8-19; 2:5-18; 3:10-18; 4:5-9; 5:13-17; 6:10-22). And despite his name change to "Beltshazzaar," so that all references of his nationality and religion were obscured (Dan 1:5-7; 4:7-9), Daniel and his God were well known throughout the empire (Dan 2:47; 3:27-4:3; 4:34-37; 5:11-16; 6:20-27). While God displays His power through Daniel in such a way to demonstrate that He is the one true God and Lord of human history, God uses Gentile nations from this point on as the means to discipline His covenant people. 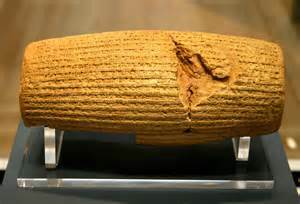 Learn more about The Cyrus Cylinder. Daniel stands unique among the Major Prophets for his ability to interpret the dreams of Gentiles (Dan 1:9, 17, 19) which themselves were prophetic. The pagan king Nebuchadnezzar has a prophetic dream of a great statue: a head made of fine gold, its breasts and arms made of silver, its belly and thighs made of bronze, and its legs of iron and feet of iron / clay. A stone will crush the statue and will become a great mountain and fill the whole earth (Dan 2:31-35). Daniel's prophecy would be partially fulfilled with the subsequent historical world empires that followed after the Neo-Babylonian (Nebuchadnezzar) empire: the Medo-Persian (Cyrus the Great) and the Greco-Macedonian (Alexander the Great) empires. While many debate whether the prophecy of the fourth Roman like empire has been fulfilled entirely, most believe that God’s kingdom has yet to be reestablished and endure forever. Because Daniel was not addressed as a prophet nor perceived as one, Jews placed his book in the Writings section during the early compilation of the Hebrew Scriptures. By the time of the Septuagint (300-200 B.C. ), the Hebrew canon placed Daniel in the Prophets section perhaps in part by the historical record showing the fulfillment of his prophecies. However, the Talmud currently maintains that Daniel was not a prophet and his work remains in the Writings section. Nebuchadnezzar's second prophetic dream was of a great tree that was chopped down to the stump on orders from an angelic being, and the mind of a man would be changed to that of a beast for seven periods of time so that the man would know that the Most High is ruler over the realm of mankind (Dan 4:10-18). Daniel interprets Nebuchadnezzar's prophetic dream as the king's loss of mind, sovereignty and subsequent humbling of his pride (Dan 4:4-37). Without extra-biblical evidence, this prophecy would be difficult to confirm; however, a cuneiform fragment in the British Museum (BM 34113 [sp 213]), translated by A. K. Grayson in 1975, suggests that Nebuchadnezzar may have had symptoms similar to that of a very serious depressive disorder or temporary insanity. Daniel interprets the prophetic handwriting of the wall to Belshazzar that his blasphemous use of the Temple's confiscated gold vessels would result in his death and loss of kingdom (Dan 5:1-31). Daniel's prophecy would come true with the fall of Nabonidus, who had returned to Babylon, and the death of Belshazzar to the Persians led by Cyrus the Great in 539 B.C. which was attested by both Greek historians Herodotus (484-425 B.C) and Xenophon (430-354 B.C). "The Scriptures inculcate chiefly the necessity of repairing what was lost by sin and of reconstructing the broken order of things." 2. Gaeblein FE ed., The Expositor’s Bible Commentary, vol. 7, Grand Rapids: Zondervan Publishing House (1992).